MURRAY HILL — Master builder Robert Moses was notorious for bulldozing through communities — without any public input — to construct highways, bridges and tunnels. Now, a 1.3-acre playground bearing his name in Murray Hill may be on the other side of the shovel — only this time around, the decision will be made by community consensus. Moses was infamous for creating a gash through Bronx neighborhoods for his Cross Bronx Expressway and would have done the same in the Lower East Side, SoHo and the West Village to build the Lower Manhattan Expressway, if the activist Jane Jacobs and others had not stopped him. But Moses was also responsible for creating a vast amount of parkland, more than doubling parks acreage to 34,673 between 1934 and 1960. The park that bears his name is anything but monumental. Sitting on 42nd Street between the FDR and First Avenue, across from the United Nations, the playground is bifurcated by the Queens-Midtown Tunnel ventilating tower, with a blacktop used mainly by a roller hockey league on one side and some handball and small basketball courts, a comfort station and dog run, on the other side. City and state officials have long been talking about razing the playground to build a new tower for the United Nations, but the community will only give up the parkland — which must be approved by Albany — if it wins some concessions. Residents want a replacement park of the same size in the vicinity and a waterfront esplanade that would stretch from 38th Street, past the UN, up to 61st Street. Residents are hoping to act quickly on this since there are some pilings in the East River left over from the State Department of Transportation’s FDR temporary outer-detour roadway for a rehabilitation project. Using them for part of the esplanade, estimated to cost $130 million to $150 million, would save money. "Robert Moses, he wasn’t interested in the preservation of New York," said Anthony, a homeless man who declined to give his last name and was the lone person was sitting on the blacktop on a frigid Thursday afternoon. Anthony was practicing playing a penny whistle he made with a PVC pipe. He liked coming to this blacktop — where he slept for many years before some benches were removed — because it was often empty except for dog walkers, he said. Before the comfort stations were closed down about a year ago, they were a favorite for cabbies. "It’s one of the few places you can park your car and not get a ticket," he said of the street next to the park. Matt Siegel, 25, who was playing with his Pitt bull mix, Havi, in the dog run, said he wouldn’t mind the park being demolished if another popped up nearby. When he learned that Robert Moses was one of the main forces behind the Brooklyn Dodgers moving to Los Angeles after blocking a Brooklyn relocation to get them to Queens, Siegel said, "We don’t like him." State Assemblyman Brian Kavanagh said nothing would happen with the park unless the community agreed on a replacement park. 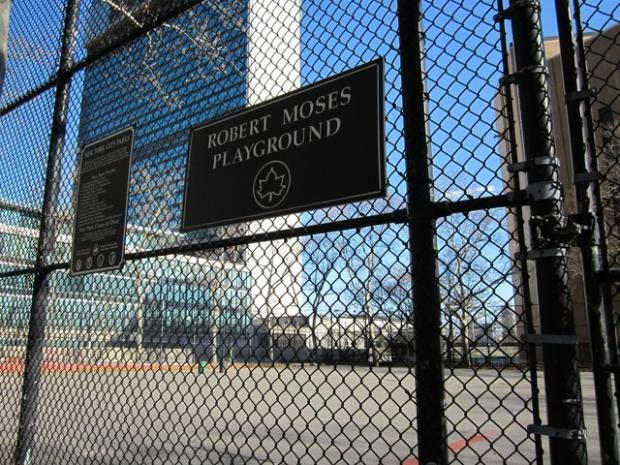 "The irony of potentially eliminating a park named for Robert Moses is not lost on some of us," he said. "We’re certainly not intending to do this Robert Moses-style." He and other elected officials involved in the planning — State Senator Liz Krueger and City Councilman Dan Garodnick — held a public forum with Community Board 6 in June on the issue and planned to have more opportunities for public comment, Kavanagh said. Even though the state DOT was supposed to have removed the pilings once its work was done in 2007, it was leaving them in place to give the city time, a DOT spokesman said. But the complicated real estate deal involves other moving parts, including selling off two city-owned office buildings occupied by UN tenants. CB6 passed a resolution on Wednesday supporting the UN takeover of Robert Moses Park as long as they get what they want in return. They know getting a replacement park won’t be easy, and they don’t want small pocket parks. "What good is that? You might be able to play hopscotch," said CB6 member Ellen Imbimbo, noting that her district has the least amount of open space per capita in the city. "We don’t know what’s going to be the piece to get the ball rolling, even slowly," Imbimbo said. "You’ve got to get state legislation through Albany for the park, but the community has to where the replacement is. In New York where can you find 30,000 square feet? You gotta look pretty hard."